I read several years ago of a study done at Harvard. The purpose of the study was to determine if stress had any affect on allergies. Turns out it does, quite significantly. The more stressed you are, the greater your reaction to allergens. When people who showed an allergic response to a host of things (e.g., cats, pollen, dust, etc.) were taught various relaxation methods, including meditation, and then exposed to the same allergens, there was no (or very little) allergic response. It was concluded that the stress hormones greatly aggravate the body’s allergic response. The take home message is that relaxation techniques are essential to maintain a sense of homeostasis. On a similar note, I read with great interest today of a recent study reported that exposure to plastic compounds (known as PFC’s), found in Teflon coatings, fast food containers, microwave popcorn bags, even stain resistant carpeting,, etc., have a negative impact on kid’s immune systems, particularly the effects of vaccinations. YIKES! The conclusions of this new study suggest sthat these chemicals may be weakening the entire immune system; most likely not just in children, but in everyone. Take time each day to sit quietly and relax. Listen to soft instrumental music. Close your eyes and focus on your breathing. Sit still for 5- 10 minutes each morning and clear your head. Release your fears, anxieties and frustrations with each breath. As you do this, you will see that you have an inner strength that will guide you through the day. Additionally, make a habit to remove as much plastic in your life as possible, from the way you prepare your food to the toilet seats and clothes you wear (opt for cotton and wool over synthetic polymers made from petroleum products). Honor your immune system today! Last year I picked up a book called Plastic: A Toxic Love Story. I HIGHLY recommend reading this book to become more educated about the dangers of repeated exposure to these petroleum products so prevalent in our lives. I took this photo for my college textbook section on pet therapy. Many people are allergic to cats (it appears to be something in the cat’s saliva which is found on the cat’s coat when they wash themselves… Be sure to wash your hands before you touch your face. 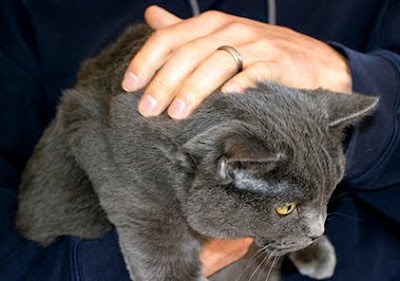 Equally important, be sure to meditate, if you are allergic to cats…and see what happens. Having taught nutrition for over a decade at the University of Colorado, the first lecture always included a brief review of the six nutrients: carbohydrates, fats, proteins, vitamins, minerals, and water. Yet it would be a gross injustice to only list these. There are several more. They include, but are not limited to: Sunlight, oxygen, prana and love. It’s not secret that the average person doesn’t get enough sunlight, a fact that came to light when it was reported last year that many Americans today are deficient in Vitamin D; the sunshine vitamin. While it is safe to say that many people do get their supply of oxygen, we can also safely assume that a great man people are not in touch with their breathing skills (Sting is often quoted as saying that most people in the Western culture do not know how to breath correctly, and he is right). Prana, a name associated with divine energy, is also an essential nutrient, yet one that most people take for granted. Becoming conscious of this divine energy facilitates a great ability to reach our highest potential. A stressed lifestyle not only tends to compromise our eating habits, but our ability to get outside and enjoy the natural world, one that is filled with sunlight, oxygen and prana. And it goes without saying that without love, we cannot live at all. Make it a habit to get outside today and go for a walk. Drink in the sunlight as you walk. 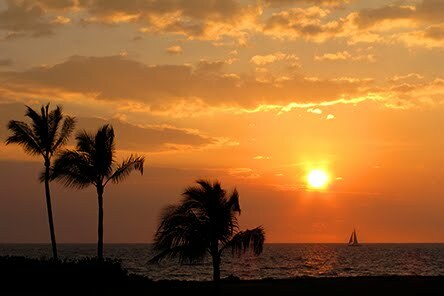 Feel the gentle caress of wind on your face and breath it in, deep into your lungs. As you breath in this fresh air, recognize that you are also breathing in the life force of universal energy (some people call it prana, still others call it Chi, and still others call it the Holy Spirit). Make it a habit to get your daily requirement of these essential nutrients as well as the obvious ones that you consume at each meal. And regarding love, this nutrient can only be absorbed with an open heart. 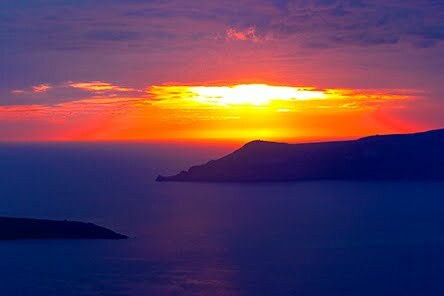 This photo was taken a few years ago during a sunset on the island of Santorini, Greece, where there is plenty of sunshine, oxygen and prana. Enjoy! In the eastern culture there is an expression called “monkey mind.” It means that your mind is distracted; racing around all over the place, just like monkey that never sits still. A racing mind that ricochets all over the place is a dangerous mind, because it cannot focus on any one thing long enough concentrate, make important decisions, or have a deep conversation with someone. We don’t have monkeys in the United States, yet we do have squirrels, and they too race all over the place. Same concept! It’s no secret that with all the distractions of modern technology, from smart phones and Ipads to video games and text messaging, humans have a serious epidemic of monkey mind, or squirrel mind (take your pick). It’s actually the ego that steers the mind’s attention in a million different directions, and while some people call this “multi-tasking” with pride, the research is clear: mutli-tasking; the art of doing more than one thing at a time and doing them well, is a myth. Monkey mind no more! Renouncing the world, moving to a monastery or becoming Amish isn’t an option for most people these days, but there is a proven way to rid yourself of monkey mind. It’s called meditation. In the eastern culture there is an expression that states we need to“ domesticate the ego” (this is code for ridding yourself of monkey mind). If you don’t already have a meditation practice, now is the time to begin. To begin, find a quite space in your home or office and sit quietly for 5-10 minutes. Close your eyes and focus solely on your breathing. Whatever thoughts come to mind, simply acknowledge them and then let them go as you exhale. Make a habit of doing this every day. One more thing that helps with taming monkey mind is keeping healthy boundaries with your technology. Let it serve you, rather than becoming a slave to it, in all it’s many forms. As an example, turn your cell phone off (including the vibration mode) from 9-11 am every day, so you can focus on what you need to do all day without the flood of distractions. 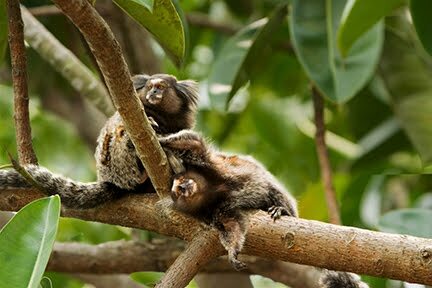 While in Rio de Janeiro a few years ago, I was able to take a day trip to Sugarloaf Mountain, where I saw these monkeys, and while they may looked relaxed in this photo, believe me, they certainly had monkey mind. Steve Jobs, founder of the Apple computer, was driven by a life purpose: to make a visible “dent” in the universe. I think everyone would agree that indeed he did, from the Ipod, to Pixar cartoon films. Like Steve Jobs, we too have a meaningful purpose in life, though each purpose will make a different impression in our world, if not the universe. Noted author, Viktor Frankl (Man’s Search for Meaning) was of the opinion that stress arises when we are not fulfilling our life purpose. Categorically, each of our purposes in life involves bringing more light into the darkness of mere being (thanks, Carl Jung). Joseph Campbell offered this advice to fulfilling your life’s purpose: Follow your bliss. Steve Job’s advice was similar: follow your own path, be different; don’t live up to someone else’s expectations. Conforming to other’s likes and beliefs makes for a very boring, if not very dark, world. It also makes for more stressful life. Being authentically true to yourself is the only way you will ever change the world for the better. The Universe is begging for your “dent.” What are you waiting for? Each of us has not one, but many purposes in life. For some it’s raising a family. For others it’s discovering the vaccine to save lives. Still for others it’s bringing a smile to thousands of faces or inspiring the hearts of many. Apathy and laziness will sabotage our life purpose. Stress finds it’s way into our hearts when one purpose is complete and the next has yet to form. What is your purpose in life? (here’s is a hint: it’s not to make lots of money). What is your dent in the universe? Get out there and start pounding away. Begin with a smile. If you are in a quandary about what to start pounding, start doing some soul searching, and listen for the answer. Then… follow your bliss. If you have not read Frankl’s book, Man’s Search for Meaning, it is a must read. And if you have read it, you might want to consider reading it again. I would also highly recommending Steve Job’s biography, Steve Jobs. It’s very inspiring, and might just help you make your dent in the universe. 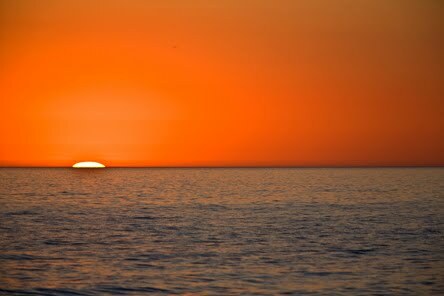 Today’s photo is a Hawaiian sunrise image… a reminder to bring more light into the world, for no matter what you do, ultimately this is all of our life purposes. It is hard to image anyone going through an entire day without smiling (or laughing for that matter), but it happens—A LOT. Results from the field of psychoneuroimmunology remind us that our thoughts can greatly impact our health, but this pathway is a two-way street. We are also reminded that our physiology can impact our thoughts and feelings as well. This was the whole message of Charlie Chaplin’s famous song (often sung by Nat King Cole… see lyrics below) called Smile. By inviting the body to adopt a happy position, brain neurochemistry begins to change—for the better. It’s that simple. A smile is a universal symbol of happiness. A smile is the currency of the heart. As the expression goes, happiness is just a thought away! Can the simple act of smiling make you happy? The answer appears to be yes (check out the link below from Scientific American). Smiling is the art of happiness, and we can all use more of this. And smiling is contagious. Pass it on. In the book, Eat Pray Love, the author, Liz Gilbert was recommend to sit in meditation and contemplate the premise of happiness. Her Balinese mentor told her to meditate on happiness by smiling. “Just sit there and smile,” he said. Good advice. In doing so, you begin to reflect on all that is going right with your life. Gratitude abounds. In doing so, you tame the voice of the ego that broadcasts its negativity, so you can hear the voice, the melody of happiness and bliss. The next time you meditate (and you can start today), close your eyes, focus on your breathing and contemplate bliss: Think it, feel it, be it…. Also take it outside, as the expression goes…. consider smiling when meeting others, particularly at the grocery store checkout stand (lots of stress in the way of boredom there). A few years ago, I was asked to write a chapter for a book called Smile, by Elan Sun Star, a world renowned photographer based in Hawaii. If you can get your hands on this book, I highly recommend it. Not only are there some great essays, but there are some incredible photographs as well. You’ll see the sun come shining through- for you. Smile- what’s the use of crying? 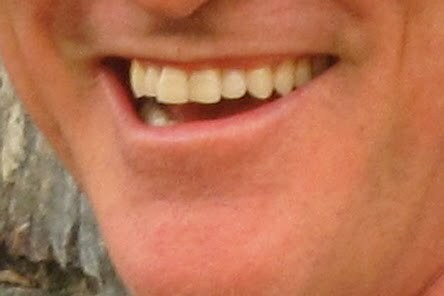 In culling through many photo ideas for this theme today, I cropped this one to fit… If you happen to know who this smile belongs to, let me know. There might be a small prize…. void where prohibited. Give Your Immune System a Boost Today! If you have seen the movie, Contagion, then you know how easily germs can spread. And… if you heard the news last week that scientists have manipulated a version of the bird flu virus into a deadly contagion, then it would be wise to do all you can to boost the strength of your immune system (just in case of nefarious minds). CDC data reveals that the average person touches their hands to their face hundreds of times a day, making an easy entrance for germs and pathogens into the body. In the movie Contagion, not everyone caught the deadly flu. Some people were immune (we can only conclude they had a STRONG immune system). In terms of nature vs. nurture, there are several things we can do about the integrity of our immune systems, both in terms of the internal environment of our bodies and our health behaviors. It’s no secret that stress can definitely suppress the immune system (through the action of Cortisol). So can poor quality sleep… and poor eating habits, specifically a diet high in refined sugar. It’s time to come to our defense system’s defenses! Make a habit to wash your hands frequently. Particularly before eating (anything). Enjoy sweets, but very few. Opt for fresh fruits, veggies and nuts every day when possible. Taking time each day to sit quietly and focus on your breathing (also known as meditation) is always a good idea and a good night’ sleep, well, you can begin with detaching form computer screens hours before you got to bed, as the artificial light will impact melatonin production (without that at appropriate levels, a good night’s sleep won’t happen). Oh, and did I mention to wash your hands often? If you haven’t seen the movie, Contagion, I highly recommend it. It’s a good lesson in the spread of germs. I guarantee you will wash your hands after leaving the theater. 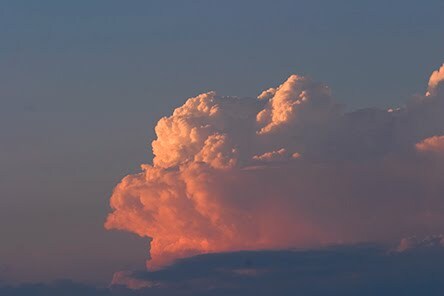 Looking through my photos (early this am), I found this image of a white cloud (at sunset) and thought of a white blood cell…Enjoy the symbolism…and don’t forget to wash your hands regularly! The start of a new year is a perfect time to start refining some personal habits, including our spending habits. The news reports of the past week, which reflected on the past year, had a common theme: last year was a financial mess. 2012 doesn’t look much better, particularly if problems with the Euro are left unresolved. Since the start of what has become known as the “Great recession” people have had to take a hard look at their finances, but experts suggest that our careless ways are creeping back. Time after time, stress questionnaires reveal that money problems rank at the top of people’s stressors. Financial wellness is comprised of many things, not the least of which is will power. Pulling in the reins of our spending, seeing each purchase as an investment (regardless of the cost). It is still recommended to move your money out of the corporate banks and into a local credit union, and this should be at the top of your list of things to do for financial wellness. It’s easy to go over budget when you don’t keep track of what you spend. Debit cards and credit cards may be great for emergencies, but consider using cash (or checks where they are still taken). Many people buy things only to find out that when they get home, they already have the item purchased. Take time to clean your house, taken mental inventory of your possessions. Take a look at your leisure habits and start to see what you can do that is free; spend more time in nature. As they saying goes, the best things in life are free. Be mindful of what you spend (without becoming stressed about it). Sunrise or sunset? You decide. This photo was taken in Florida last year. It seemed like an appropriate photo for this, the first photo for the 2012 blog. New Beginnings! Enjoy!